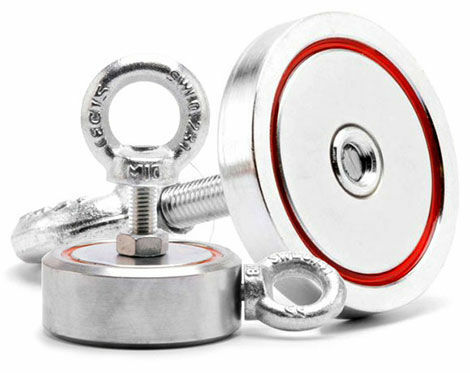 Modern Permanent Magnets can attract steel objects or other magnets from large distances and cause trapping injuries. Strong magnets should not be given to children. Many Magnets are brittle and may shatter if they are allowed to ‘jump’ together or they jump onto a steel surface. Strong Magnets may affect or interfere with sensitive electronic instruments. Always keep magnets at least 50mm from such devices. Magnets can destroy information stored on magnetic media such as credit cards, floppy discs and computer hard drives. Keep them at least 20mm away. Analogue watches, televisions and computer monitors can be permanently damaged by placing magnets near them. Users of heart pace makers should avoid being near magnets. Do not use magnets in explosive atmospheres. 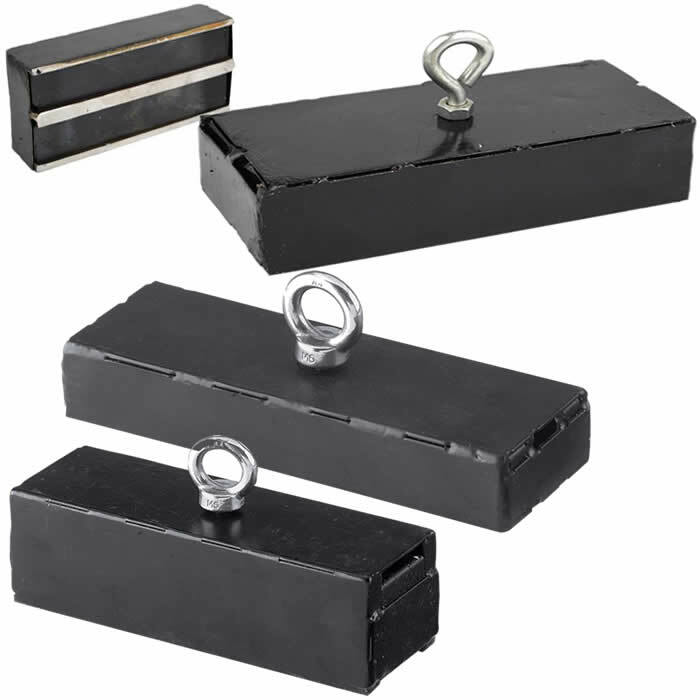 This versatile retrieving magnet is a great tool around any shop, garage, septic tank, pool or ranch. Easily retrieve lost fishing gear, separate scrap iron from waste or clear your garage of nails, screws and sharp metal after your next project! Whatever the application, you can attach your own choice of line or the retrieving magnet can be easily mounted to your wall or workbench as a holdfast. This powerful magnet will temporarily affect television colour, it can trap fingers, wipe and distort tape and video recordings, affect watches, etc. Attach the interference bar (keeper bar) when not in use and stow at least 2 meters from boat compasses. While the sea searcher will withstand heavy lifting duties the core is brittle. The magnet should not be dropped on hard surfaces. When lifting heavy objects from under water, the magnets capacity is even greater until the object reaches the surface. Be ready to take hold of the object at this point. Neodymium magnets have a maximum operating temperature of 80 degress C above which their power deteriorates rapidly. We would not recommend this magnet be used by children under 16 without supervision!